Time traveling tetrapod, planet Styrofoam, disease evolution, and more! Noah’s Ark: a floating saucer? And Don’t Miss . . .
Did you miss it? Catch last week’s News to Note or any other! Hot, hot, hot, hot, and hot—meet the first exoplanets found by NASA’s Kepler space telescope. The five planets—dubbed Kepler 4b, 5b, 6b, 7b, and 8b—are the first discovered by the Kepler Mission, which launched last March. They were originally discovered shortly after the telescope’s launch, and their existence has since been confirmed by separate methods. The telescope has also identified several hundred other candidate exoplanets yet to be confirmed. Microbial resistance to antibiotics is commonly provided as an example of “evolution in action.” But when it comes to Neisseria meningitidis, scientists haven’t observed such “evolution” in years. N. meningitidis is already well known to medical researchers, for it can cause meningitis; and as a target for antibiotics, some have worried the bacterium may evolve increased antibiotic resistance. However, a new study from Sweden’s Örebro University indicates that the rate of resistant bacterium has not increased in more than a decade. That is, while resistant N. meningitidis individuals do exist, they are not spreading—at least, not in Sweden. Biomedical researcher Sara Thulin Hedberg conducted the study for her doctoral dissertation. She concluded that the reason resistant strains are not spreading is that resistance is not particularly advantageous for the bacteria. Resistant bacteria cannot multiply as rapidly as other strains and do not infect hosts well. They are easily out-competed for resources by other strains in antibiotic-free environments. That conclusion is notable for creationists, who point out that nearly all common examples of “evolution in action” do not demonstrate the increase in genetic information that true molecules-to-man evolution would require. The fact that the antibiotic-resistant N. meningitidis are less fit than their susceptible siblings suggests that their resistance probably involves a loss of genetic information or else no change in information. Antibiotic Resistance of Bacteria: An Example of Evolution in Action? 4. Infectious Protein Particles Evolving? Can non-life evolve? Scientists at the Scripps Research Institute have discovered that infectious protein particles called prions can adapt to new environments and compete with one another. Prions, known for their role in causing diseases such as “mad cow,” are similar to viruses in that they are not alive, yet are able to replicate themselves through the assistance of a host. Specifically, abnormal (disease-causing) prions multiply by corrupting normal prions in the body. 5. 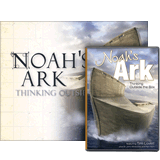 Design of Noah’s Ark Incorrect? Bible-believers have spent a great deal of time considering the design of Noah’s Ark. Is it possible that they—and Genesis—have it all wrong? A Babylonian clay tablet telling the Flood account describes Noah’s Ark as a “giant circular reed raft,” the Guardian reports. The artifact was found in the mid-twentieth century, but was only much later translated by the British Museum’s Irving Finkel. 6. And Don’t Miss . . .
Should dolphins be granted “non-human person” status because of their relative brain size and apparent high intelligence? “It may not be ethical to keep dolphins in aquatic amusement parks for our entertainment, or to kill them for food,” reports PhysOrg on research by City University of New York and Emory University scientists. But the Bible tells us that only man was made in the image of God ( Genesis 1:27 ). National Geographic News reports on a great example of observational science at work in astronomy—a breath of fresh air relative to most billions-of-years-based astronomy. In October 2008 we said goodbye to the Phoenix Mars lander, and it may now be time to bid adieu to Mars rover Spirit. As with Phoenix, the rover had launched more than one news item in News to Note—most recently in December. Is primate intelligence “overestimated”? So suggests a new computer model that chalks up grooming behavior to simple fear. Photos taken by the Hubble Space Telescope purport to show galaxies as they were more than thirteen billion years ago. Of course, that belief requires more than thirteen billion years’ worth of assumptions about the behavior of light, the nature of the universe, and more. Was Mammalodon an ancestor of modern whales, a whale-like creature that lived alongside modern whales just thousands of years ago, or neither? What’s clear is that presuppositions play as great a role as fossil evidence in answering that question. Suspiciously absent from the Boone County (Kentucky) Recorder’s The Decade in News story is any mention of our Creation Museum, which has brought hundreds of thousands of visitors to Boone County in addition to the local investment the museum represents. Was the museum left out intentionally or just forgotten, we wonder? However, the museum is mentioned in a community worship directory advertisement, and the museum’s Christmas attraction is listed in the “Things to Do in the Neighborhood” feature of the newspaper. Remember, if you see a news story that might merit some attention, let us know about it! (Note: if the story originates from the Associated Press, FOX News, MSNBC, the New York Times, or another major national media outlet, we will most likely have already heard about it.) And thanks to all of our readers who have submitted great news tips to us. If you didn’t catch all the latest News to Know, why not take a look to see what you’ve missed?